Everytime I watch a con movie such as Special 26, I am inspired to become a well-renowned con artist. Or maybe just a con artist. Or an artist. Or a con. Or..whatever my mummy-pappa want me to become. Of course, I go with the bestest and safest option, a secret ninja turtle. However, before you make cool statements out of that & subscribe to that philosophy, maybe Akshay Kumar lost a number of grey cells in the midst of buffing up. So he made a few number of mistakes. Because he finally made a wise decision by choosing this movie. Mr.Desi Munda looks good, acts well & is bound to charm you with his smile in this movie. 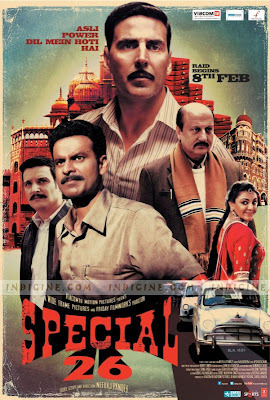 Special 26, made by Neeraj Pandey(director & writer of A Wednesday), is a con movie that instills the elements of comedy, suspense, drama with a pinch of romance. It's light, it's amusing, it keeps you glued to your seats & it can be watched without downing alcohol. You can watch it with your mom dad though I advise parents not to bring their 4-year-olds to watch this movie. The last thing you need is the kid in the row behind you playing KBC with his mom-dad about the movie's characters,plot & locations. So please, no kids please. As much as I love them, I don't like them in theatres. Unless it's Ritesh Deshmukh's Aladin in which case, I don't give a poop. Anupam Kher & Manoj Bajpai have given some classic performances. Huge admiration for the wide range of expressions and emotions Anupam Kher can deliver within the tangents of one character. He's truly brilliant. What makes him so admirable is how smoothly he slips in & out of multiple identities of a singular character. He's truly adorable in this movie. Truly a delight to watch. Manoj Bajpai is another fine actor. No one could've portrayed his character better in this movie than himself. He has his own style and understanding and I think audiences are far from objecting to his interpretation. Well done Bajpai. Well done indeed. Besides the Kumar-Kher-Bajpai trio to look out for, other key hits in the movie would be Jimmy Shergill & Divya Dutta. Their small but pivotal roles in the movie aid in keeping up the spirit of the movie. Good casting call by the production team. Except for Kajal Aggarwal. She has a pretty face but she can't act till Courage the Cowardly Dog got courage. Or my mom stopped watching what's-that-latest-crap-bahu-show. But then again, her role was pretty minor. They didn't really need someone who knew acting for her part. So fair enough .Good economically-efficient casting call by the production team. The cinematography was wise,suitable to the movie's plot. Dialogues were well-written. Background score was amazing. Irshad Kamil's lyrics are pure honey for the soul. M.M.Keeravani's music only complement his lyrics, adding divinity to them. Good performances, good scripting, brilliant direction, soulful music & great cinematography. Definitely worth catching in the theatres. Watch it for Akshay Kumar, Anupam Kher & Manoj Bajpai. Move is truly entertaining in every essence. It's a good ensemble of cast & production team. And don't forget, asli power dil mein hoti hai. Yeh baat tum kabhi na bhool na!